You know what they say? It's all about location! That's why our Red Roof Inn is the best spot to stay while you're visiting Ocoee, FL. 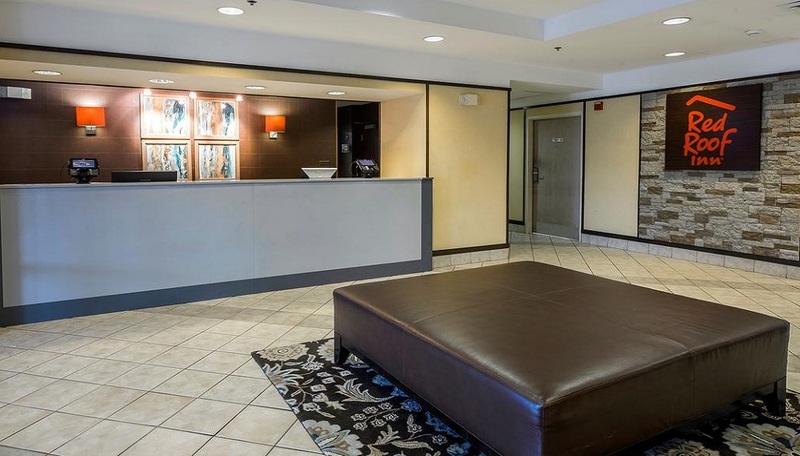 Our hotel is just footsteps away from all the hustle and bustle of Universal Studios Orlando and Walt Disney World, and we're a short 25-minute drive to the Orlando International Airport. Experience convenience, exceptional service, outstanding amenities and perfect, spacious rooms that will make you feel right at home. 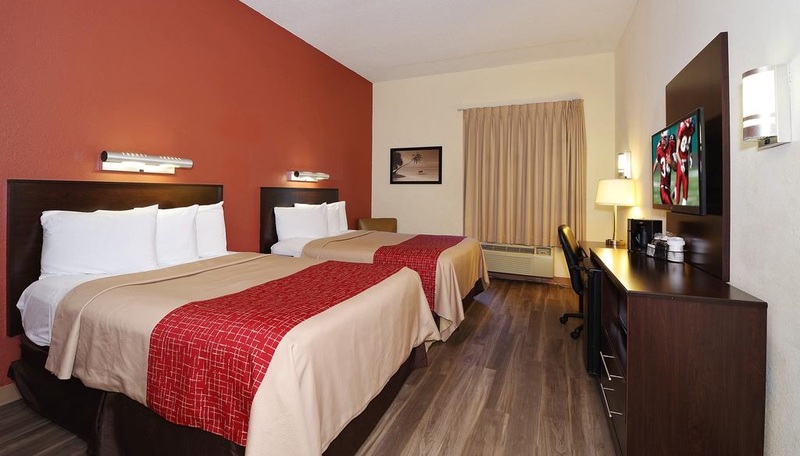 Experience comfortable accomodations at pet-friendly Red Roof Inn Hotel offering free continental breakfast, high-speed Wifi, ample parking, an outdoor pool, 24-hour coffee bar, a business center, and a coin laundry facility. But wait, there's more! Who likes their happiness on the rocks? You're in luck - happy hour is served in the lobby from 5pm–7pm. Sleep like royalty with all the accommodations we offer to our guests, including contemporary furniture, bathrooms with marble countertops, a comfortable easy chair, flat screen TV, ironing board, microwave and a mini-refrigerator. 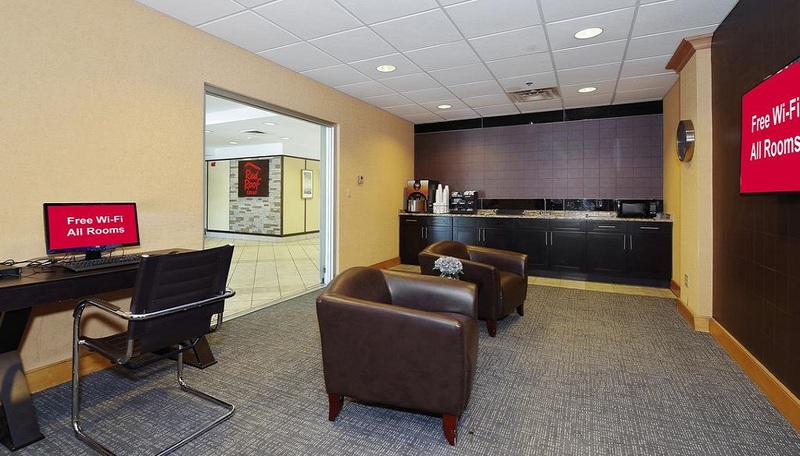 These incredible amenities will make you feel at home - your comfort is our number one priority! The best part of exploring a new destination can be the new food you get to taste. You'll find plenty of scrumptious restaurants near the hotel such as Denny's, Arby's, Bangkok Thai Passion, Hai San Restaurant, Papa John's Pizza, Dunkin' Donuts, Mi Querida Colombia Restaurant, and Bakery and L-N-W Pizza. With multiple dining establishments right at your fingertips, you can eat your heart out. 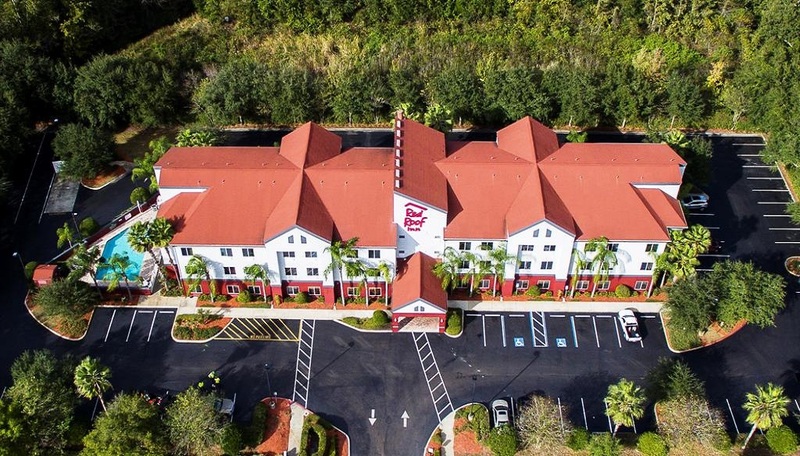 During your next Ocoee vacation, stop by and visit one of the many shopping venues located within comfortable distance from Red Roof Inn Orlando West. West Oaks Mall is a local mall located in Ocoee, Florida near Orlando. It has 115 store spaces, a food court, and a 14-screen AMC theater. You can spend a full day here browsing, shopping, and treating yourself to a new outfit. Looking for outdoor adventures in Ocoee, Florida? You're in the right place! Sammy Duvall's Watersports Center offers parasailing, water skiing, wakeboarding, and tubing. Wekiwa Springs State Park is located in beautiful Central Florida and offers a wide range of outdoor adventure opportunities, and Kelly Park offers hiking and wildlife viewing. Ocoee isn't located on the coast, but fortunately our hotel is close enough to enjoy a day trip to some of Florida's best beaches. Plan a night out and enjoy Ocoee, Florida's exciting nightlife for adults, including night clubs, bars, live music and concerts. West Wine Lounge, Frank's Place, RusTeak Restaurant & Wine Bar, Tequila's, Ellie Lou's Brews & BBQ, and The Tasting Room will not let you down. All children are welcome. Free! All children under 18 years stay free of charge when using existing beds. Free! One child under 2 years stays free of charge in a child's cot/crib. One older child or adult is charged USD 10 per night in an extra bed. All further older children or adults are charged USD 5 per person per night when using existing beds. The maximum number of extra beds/children's cots permitted in a room is 1. Any type of extra bed or child's cot/crib is upon request and needs to be confirmed by management. Supplements are not calculated automatically in the total costs and will have to be paid for separately during your stay. A pleasant stay for a fair price. The room was clean, nicely laid out and the style and color scheme was attractive.All in all a pleasant stay for a fair price. We were visiting our daughter in Windermere and found this hotel handy to her location.staff exceptionally helpful and friendly. all rooms had mini fridges. Rooms were spacious, beds comfortable, staff extremely friendly. I have stayed at this hotel several times and will continue. The staff is great. Location is good. The rooms are clean and equipped. The staff is very friendly and always accomadating at exceptionally low rates. I have stayed here twice now and will continue to do so whenever visiting Orlando. 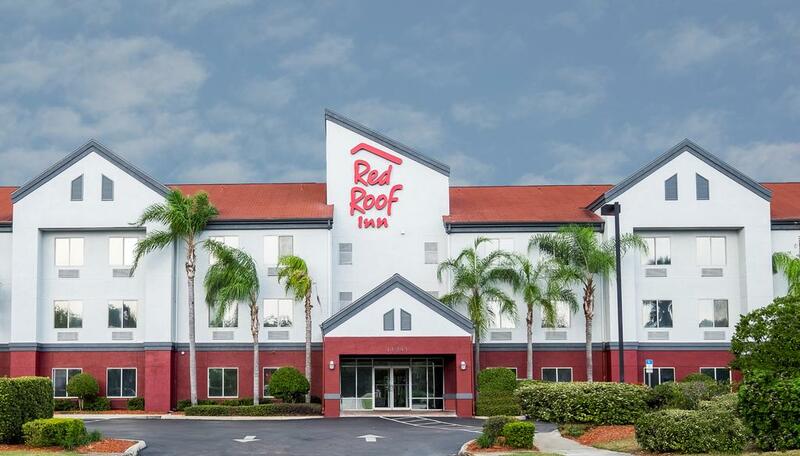 In the Orlando area, Red Roof Inn is an excellent value. We found it to be quiet, clean and comfortable. good coffee and tea are available. Several cafes within walking distance. I would recommend Red Roof Inn to a friend and I will stay there the next time I have business in Orlando. Nice accommodations, will use again. Weekend stay for triathlons in Clermont. It's about 20 minutes from the triathlon location and a straight shot down Rte 50. There are multiple places to eat and shop near by. The rates and accommodations were worth the little extra drive. The hotel and rooms were very clean, well kept and the towels were very nice. Service was friendly at desk. I would definitely use again. It was a wonderful visit. It was located only 10 minutes away from my meeting and access to the interstate was vital. The rate was great and having Dennys restaurant out your front door was awesome. Stayed at the hotel 3 different times and all 3 times I have had a wonderful stay.